Sports clubs – looking for new volunteers? Is your Clubmark club seeking new helpers? There is a very helpful DofE website. Sports Leadership courses are run by Schools, Colleges and Universities. Here is an example of courses. How do you go about finding these volunteers? Firstly, enquire among your own membership to see if there are any family members who would be interested in doing their volunteering with your club. It’s always easiest to start with people who know you and know what you do. Secondly, it is worth building up a relationship with local organisations that deliver DofE and Sports Leadership courses. Bear in mind that DofE and education course programmes run to strict annual timetables and the students will be required to do their volunteering in a specified time window. So clubs need to plan ahead. Don’t expect an e-mail this week to generate a group of helpers for your event next weekend! If you manage to make contact with the right person you can ask them about their needs and, most importantly, their time-scale. The ideal situation for a club to be in, is to be ready to give relevant information at just the right time for it to be distributed to potential volunteers. Are you worried about what to say to students? Just describe your volunteer roles in language they will understand – and don’t assume they know anything about your club or sport. And be aware that they will be much more interested if they can work in pairs or small groups. It might sound like a lot of trouble, but schools and colleges work on annual cycles and like to repeat what works. If you can get the right contact, build up a good working relationship and deliver worthwhile opportunities you could be setting up a system that runs for years. And, while these young people may start as volunteers, their experiences with you may turn them into participants, members or even ambassadors for your sport. So make sure you look after them well. Can you tell your team workers from your time-wasters? Who is the most important person in your organisation? “The Chairman” I hear you cry! Having been a chairman of a large PTA for a number of years, I actually think the most important job in any association, charity or amateur club is the volunteer manager. This is the person who inspires, motivates and nurtures the workforce – all the people who give up their time to take on responsibilities to help the organisation. The volunteer manager could be anyone on the team. You might have a dedicated role, or you may have another post holder who’s particularly good with people and who takes charge. Particularly good with people – this is the key! You need someone who is easy to get on with, understands and cares about others and who knows the difference between what motivates and what dispirits. It helps if they are involved in the organisation so that they are familiar with what is going on – but everything can be learned. Lack of experience is not a barrier: lack of empathy is. What should a volunteer manager do? 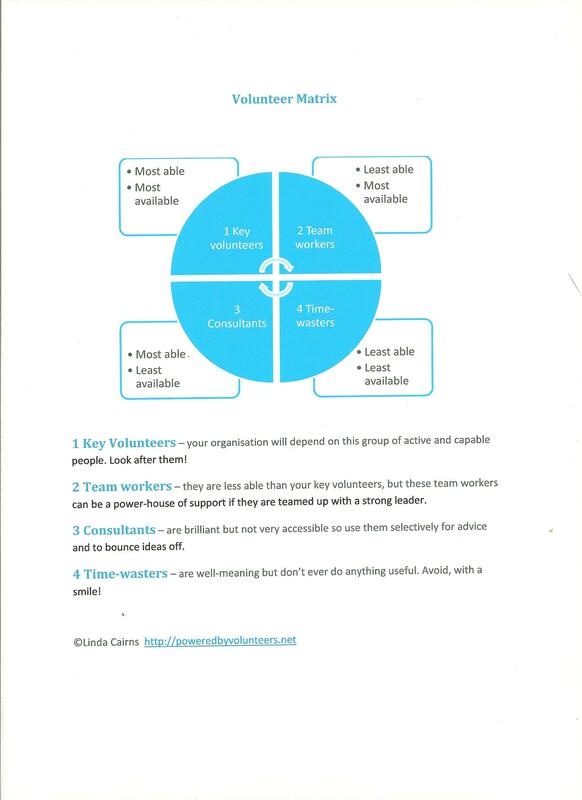 To sum up: recruit one good volunteer and you have someone who can take on one role: Recruit one good volunteer manager and you have someone can maintain a supply of volunteers to keep your organisation rolling.